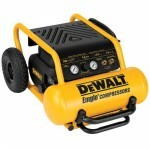 What is the Best Portable Air Compressor? While most of today’s air compressors are “portable” to a point, there are a few that stand out for their easy portability and they all do it in a different way. One is powerful unit with all-terrain tires. Another is a good lighweight all-around compressor with an easy to transport shape. The last is a gas-powered model that can go where others can’t. Here are what we consider to be the top portable tools available today. One of the best values out there in terms of power and price, the DeWalt D55146 has a go anywhere attitude. While its 85 pounds don’t make it a lightweight, the large high-quality tires and collapsible handle make it easy to pull around much like you would with luggage. 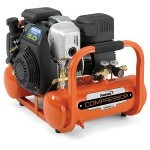 It’s popular with contractors for both its 5.2 CFM at 90 PSI and portability factor. The shape allows it to easily fit even in the trunk of most cars. Easy to read controls and low noise complete the package. 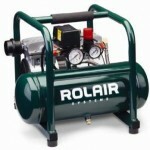 Know more for being the quietest air compressor around, the Rolair JC10 is also highly portable. Weighing 39 pounds and having a cushioned handle allow it to easily be carried from room to room or wherever you need it. The JC10 is a well-designed unit with compact dimensions (17x16x15). There’s an integrated roll cage to keep everything protected and the entire unit is coated in the famous Rolair dark green paint. The JC10 has a very high customer satisfaction rating. This Industrial Air unit can truly go where others can’t. This is one of the few gas-powered air compressors that are actually compact in size. Without the need for electricity, the CTA5090412 can be run in pretty much any outdoor area. Weighing in at 74 pounds, it actually feels lighter and more portable than you would expect. The Honda powered engine is extremely efficient and practically maintenance free. The Industrial Air is perfect for remote jobsites or if you own a lot of land.